Here are case briefs on a few of our previous and current clients. If you would like to hear from our clients first-hand what it's like to work with us, we are happy to provide references. 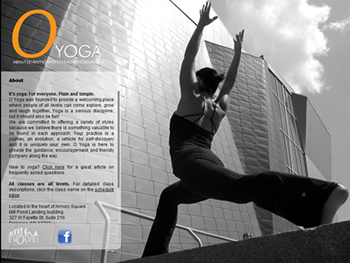 Beautiful photography provides the backdrop for the content on the website for the new O Yoga Studio in downtown Syracuse. Just the basics are provided – a brief about page, the schedule, rates and teacher bios – while the images convey the atmosphere of the studio itself. The site serves up a different random photograph every time you visit, it is smartphone friendly, and it is integrated with the popular Mind Body studio management software. Photography by Joseph Sisko. Dancing Diablo, an animation company based in New York and Caracas, needed a website that would show off their stunning and multifaceted portfolio. 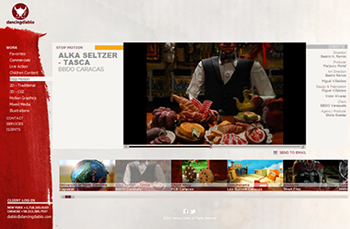 We built them a custom video player and embedded it into a site that is simple yet elegant and feature-rich. Site visitors can peruse the categorized playlists, send videos to friends, or build and share their own “favorites” library. The backend makes it a snap for Dancing Diablo staff to add fresh work to the site. The site is smartphone friendly, with video versions that play on all popular platforms. The Louisiana Resource Guide is an ambitious online directory of social, educational, health and legal services in the state. The website was designed by the Louisiana Resource Guide staff themselves, and is built to be user friendly and accessible to agencies that want to add or edit information about their own services. We built the site using the Drupal CMS, heavily modified to accomplish the LRGs goals. The directory has both English and Spanish versions. It is searchable by category, geographic location and keyword. Agencies that want to put their services into the Guide are led through an easy step-by-step process, while website administrators have final say over what makes it into the guide. The Guide is also integrated with Twitter and Facebook, and a mobile friendly version of the theme makes the site easy to navigate on smartphones. 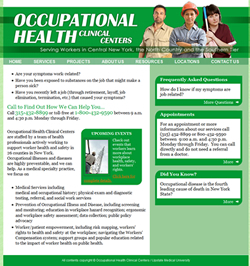 The Occupational Health Clinical Centers provide much-needed information and healthcare to workers who have been hurt on the job or are at risk of workplace injuries. The website is designed to deliver information about workplace hazards and to invite those who have been hurt on the job to seek treatment. It is a no-frills, fact-based website that conveys the professional and compassionate nature of the clinic staff, the diversity of the workers they reach out to and the breadth of their projects. The site was developed using the Drupal CMS so that clinic staff themselves can update it. 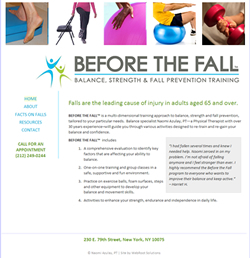 Before the Fall is a physical therapy program designed to help people with fall-prevention, balance and strength. We provided a basic website with easy-to-read fonts, vivid colors and all the important information about the program and the physical therapist. The website for Ithaca-based musician Dani DiCiaccio has everything an up-and-coming artist needs. Her new EP plays while you browse the site. There is plenty space for news and information about the musician, and you can download the EP for free, as long as you add yourself to her mailing list. 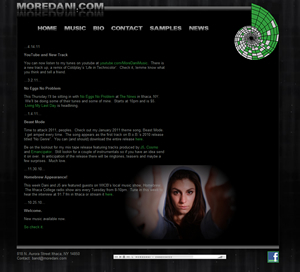 The site is built using the WordPress CMS, so Dani can do site updates herself. Custom php coding blocks access to the mp3 downloads until users provide a validly formatted email address. 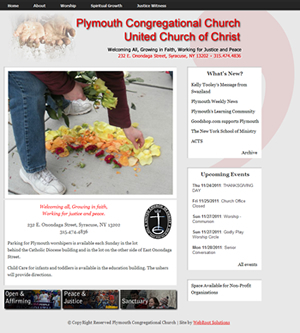 Plymouth Congregational Church is a center of the progressive community in Syracuse, NY. Their website features a slideshow of photos, recent news, and upcoming events, and it highlights their commitment to an open and welcoming, peace and social justice. The site is build using the popular content management system WordPress, and church staff are able to update all aspects of the site themselves. We also provided them a secure area of the site where they can post password-protected information for board members. The design for the Indian Creek Watershed Association website reflects the mountain streams found in Monroe County, West Virginia where the Association is working to preserve the abundant local water resources. Along with beautiful photographs of the creeks that make up the Indian Creek Watershed, the website features numerous useful tools for the group. There is an online membership registration form and a landowner survey, as well as an events calendar and an e-newsletter signup. The group is able to manage their own site through a customized content management system. Another Mother for Peace is an anti-war organization founded by mothers in the 1960s. Their previous website was static and difficult to manage, so they asked us to build them a site that would be easier to use. They were also ready for a new, more-vibrant design. We quickly set to work creating a site around their beautiful sunflower image accompanied by the words “War is not healthy for Children and Other Living Things.” The site is built with a customized and easy to use content management system that group administrators were able to quickly learn how to use. In addition to pages presenting the group’s mission and history, the site includes “Peace Homework” for parents who want to work against war. It also features and blog with updates about the group’s latest activities and an e-store where the group sells numerous products featuring their sunflower image. The e-store is integrated with PayPal and is fully customized to allow numerous shipping and tax options and to provide the group with sales reports. This community-based activist organization lacked both funds and Internet expertise, focused as it is on a grassroots campaign. They came to us with a sloppy, disorganized volunteer-generated website and asked for a simple makeover – nothing fancy, just enough to convey their purpose and activities. On almost no budget, WebRoot Solutions started from scratch to create a standards-compliant website that is both attractive and useful to visitors. Our main intent was to make it possible for visitors to quickly navigate the site and easily get involved with CNYPP’s organizing efforts. With its mission to exhibit art that "inspires resistance and promotes social awareness," we are proud to have helped this new art gallery get up and running on the Web. The site features a unique WebRoot Solutions layout, including advanced page-resizing capabilities. Users can easily see and sort through all the exhibits, community events and films planned for the gallery. Meanwhile, gallery staff can add new events and pages through a simple interface, with complete control over which events are featured on the homepage. The site also includes an e-newsletter sign-up feature coupled with a blastout list, provided at no extra charge through our all-inclusive website hosting package. WebRoot Solutions even helped ArtRage acquire and install audio/visual equipment for their small theater. This theater group, directed by Colombian torture survivor Hector Aristizabal, had a static site that was difficult to update. We did a modest makeover of the design while adding dynamic features to the homepage so visitors could immediately see upcoming shows and workshops, as well as recent news about the company. 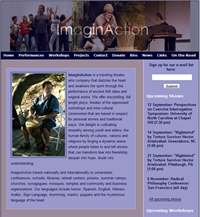 The site also features a cross-browser compatible drop-down menu that ImaginAction can add pages to through the new user interface. We are currently hard at work adding a photo and video gallery to the site as well. 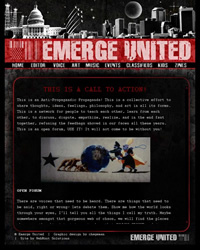 Emerge United uses its website to carry its offline mission of promoting creativity onto the Internet. The client came with a very clear and specific vision for WebRoot Solutions to make real - including a complete design template for us to adapt into a functional multiple-feature website. The site includes a dynamic events calendar and image gallery. Once we put content-management software and page templates in place, we turned the whole site over to Emerge United so they could upload and manage content on their own. This progressive-merchandise retailer had recently hired another development firm to rebuild their e-commerce system from the ground up. But once it went online, SCW grew dissatisfied with the responsiveness of those developers and wanted the site to have a more-professional design. They contacted WebRoot Solutions with a huge list of software bugs and added-feature requests, as well as an interest in a design makeover. We quickly got to work attacking problems with SCW’s Drupal content-management system and UberCart e-commerce application. We added features to the shopping cart, inventory and checkout processes. We debugged search problems, fixed pricing quirks and enabled more-convenient displays for store administrators and customer service personnel. Meanwhile, we started overhauling the site’s design and navigation. We renovated the home page, instituted a new set of menus to make navigation more intuitive to new visitors, and we replaced stale, database-generated catalog pages with visually appealing, custom-designed product arrays. 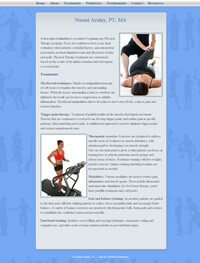 Naomi Azulay, an established physical therapist, asked us to design a “light and clean-looking” website. With a basic color scheme she suggested, we set about creating this professional-looking, yet playful site that conveys Naomi’s personality while providing easy access to information about her practice. The site is built with a Content Management System so Naomi can freely edit her own content from now on.